Do you or your family notice sinus and cold like symptoms in your home, but feel better when you get away from your home? This may indicate that you have hidden mold and require a mold removal services or inspection. Maybe you had a window leak or toilet overflow and now water has gotten into hidden cavities and has now created a moldy breeding ground. 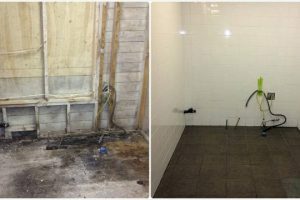 Our team will locate the cause of the water infiltration repair, contain and remove the mold contamination. This means cutting out building materials, grinding and cleaning the structural materials. 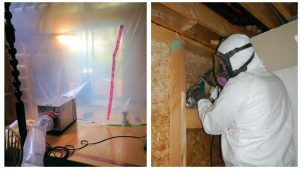 We utilize containment with certified air scrubbers vented to the outside to eliminate mold spore release and cross contamination within your home or neighbouring homes. We will evaluate the space to determine the cause of the moisture infiltration. Then a scope of work and written estimates will be provided for the remediation and rebuild. Isolate the contaminated area by setting up containment chambers and supping negative pressure to avoid exposing homeowners. Begin to address the source of moisture by repairing and sealing the area to ensure moisture cannot re-enter to promote future mold growth. 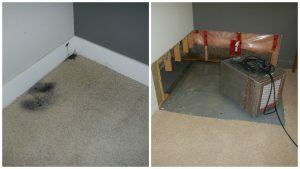 Remove and dispose of all wet and mold-damaged porous materials. Remediate the moldy affected areas by using wire brushes, grinders and in extreme cases, sand blasting. Scrub all moldy surfaces with water and our Anti-microbial agent “Mayken Solution” to kill all bacteria. Remove, Remediate, Restore, Reconstruct, Rebuild, Results! After the remediation and final clearance testing has been completed, we can now begin the rebuilding process. Our Rebuild Crew will restore your property to its previous state, or improve and redesign in any way. Our team is reliable and highly experienced in complete rebuilds and renovations, from floors to walls to ceilings. A written estimate can be provided for any rebuild work, for you to review prior to rebuilding. Get our specialized team working for you, to get rid of your mould problem.